The Shure BETA 57®A is a precision-engineered, dynamic microphone designed for professional live sound reinforcement and studio recording. A tight, supercardioid pattern delivers high gain before feedback, maximum sound isolation, and minimum off-axis tone coloration. The tailored frequency response of the versatile Beta 57A accentuates the fine details of amplified and acoustic instruments, especially in high sound pressure level(SPL) environments. A proven shock mount system, hardened steel-mesh grille, and superior build quality withstand the rigors of daily sound reinforcement. Keinen Teil des Mikrofongrills mit der Hand verdecken, da die Leistung des Mikrofons dadurch beeinträchtigt wird. Das Mikrofon auf die gewünschte Schallquelle (z. B. den Sprecher, Sänger oder das Instrument) und weg von unerwünschten Schallquellen richten. Das Mikrofon so nahe wie möglich an der gewünschten Schallquelle platzieren. Das Mikrofon sehr nahe platzieren, um eine zusätzliche Bassanhebung zu erzielen. Nur ein Mikrofon zum Abnehmen einer einzelnen Schallquelle verwenden. Um eine bessere Rückkopplungssicherheit zu erzielen, weniger Mikrofone verwenden. Den Abstand zwischen Mikrofonen mindestens dreimal so groß wie den Abstand des Mikrofons zu der Schallquelle halten (Regel „Drei zu Eins“). Mikrofone möglichst weit weg von akustischen Reflexionsflächen platzieren. Bei Einsatz des Mikrofons im Freien einen Windschutz anbringen. Das Mikrofon möglichst ruhig in der Hand halten, um mechanische Störgeräusche und Vibrationen zu minimieren. The following table lists the most common applications and placement techniques. Keep in mind that microphone technique is largely a matter of personal taste; there is no one “correct” microphone position. Guitar & Bass Amplifiers 2.5 cm (1 in.) from speaker, on-axis with center of speaker cone. Sharp attack; emphasized bass. 2.5 cm (1 in.) from speaker, at edge of speaker cone. Sharp attack; higher frequency sound. 15 to 30 cm (6 to 12 in.) away from speaker and on-axis with speaker cone. Medium attack; full, balanced sound. 60 to 90 cm (2 to 3 ft.) back from speaker, on-axis with speaker cone. Softer attack; reduced bass. Snare Drum 2.5 to 7.5 cm (1 to 3 in.) above rim of top head of drum. Aim mic at drum head. Most “snap” from drumstick. Tom-Toms One mic on each tom, or between each pair of toms, 2.5 to 7.5 cm (1 to 3 in.) above drum heads. Aim each microphone at top drum heads. On double head toms, you can also remove bottom head and place a mic inside pointing up toward top drum head. Medium attack; full, balanced sound. Brass & Woodwinds Brass: 30 to 90 cm (1 to 3 ft.) away, on-axis with bell of instrument. Bright, clear sound. Woodwinds: 2.5 to 15 cm (1 to 6 in.) away, on-axis with bell of instrument. Bright, clear sound. Bell of instrument 90° off-axis from front of mic. Softer, mellow sound. A supercardioid microphone has the greatest sound rejection at points 120° toward the rear of the microphone. Place the microphone so that unwanted sound sources, such as monitors and loudspeakers, are at these angles, not directly behind it. To minimize feedback and ensure optimum rejection of unwanted sound, always test microphone placement before a performance. 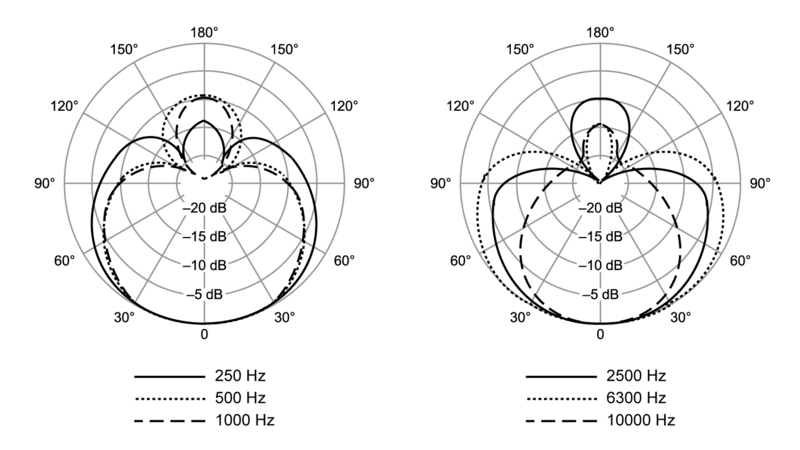 Unidirectional (cardioid) microphones progressively boost bass frequencies by 6 to 10 dB below 100 Hz when the microphone is at a distance of about 6 mm (1/4 in.) from the sound source. This phenomenon, known as proximity effect, can be used to create a warmer, more powerful sound. To prevent explosive low frequency sound during close-up use, the bass response gradually rolls off. This provides greater control and helps the user take advantage of proximity effect.